The local economy was on the rise in 2015, and residents were able to enjoy new venues for eating, see an expanded realty market and enjoy new options for shopping and styling. However, like most growing cities, the new development also brought controversy. The overpass for State Route 347 will likely force some businesses to relocate, projects that have been rumored for years are still in limbo and the new businesses that arrived left some residents unimpressed with the city’s lack of lively attractions. Nov. 14 marked the return of a revamped Second Saturday Market in Maricopa after a slow first attempt. The farmers market allowed residents to purchase 60 pounds of food for $10 and provided local merchants with a new outlet to reach potential customers. 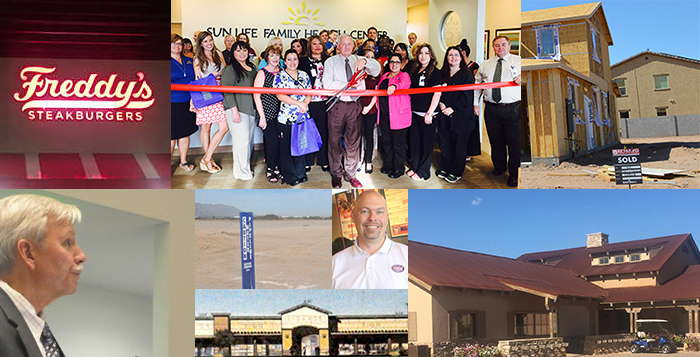 The Sun Life Family Health Center moved to its new location at 44572 W. Bowlin Road across from Copper Sky Regional Park in early August. The new building was divided into family practice and pediatrics sections and features 12 examination rooms in the family practice section and six in the pediatrics side. The old building on Hathaway became Sun Life’s Center for Women. In mid December, the Maricopa Planning & Zoning commissioners approved a development review permit for the proposed Edison Pointe shopping center south of Fry’s Marketplace on the east side of State Route 347. The development is designed for stores and shops, an auto-repair business, a sit-down restaurant and a fast-food restaurant. Traffic issues are still a concern for the shopping center, and no stores are confirmed to be in the complex yet. “This is something that we need for economic development,” Commissioner Michael Sharpe said. The Duke at Rancho El Dorado went back on the market after six years. Hiro Investment LLC purchased the golf course in 2009 for $1.45 million and is currently asking $4.995 million for a return on their investment. The property includes the 7,011-yard course, 5,400-square-foot clubhouse and the 3,000 square foot veranda. Due to development changes and a lack of committed businesses, the city delayed the creation of the Estrella Gin Business Park. The city bought the Estrella Gin property for $3.2 million in 2011 and paid almost $48,000 for a feasibility study for a business park. The new fire station is already on the property, a Public Works building is being constructed, and the Amtrak station will be moved to the site. However, the planned business park keeps hitting snags with utilities and access. Pinal County saw its unemployment rate drop from 6.3 percent to 6 percent despite a 2.6 percent increase in the county’s population. The unemployment rate was at its lowest point of 5.6 percent in May, but has steadily remained lower than 2014. Arizona’s unemployment rate is also 6 percent, and research administrators are optimistic about the state nearing pre-recession levels of jobs. “We’ve grown, and we’re still gaining jobs. That’s very, very, very difficult to do,” said Tim Kanavel, Pinal County Economic Development manager. After years of dipping sales, 2015 provided positive results for many Realtors in Maricopa and the surrounding regions. Property values increased and the seven-year economic downturn left buyers with plenty of options to pick from. “2015 will finish with double-digit increases in home sales and a modest and sustainable increase in appreciation rates, so it was a good year,” Maricopa Real Estate Company associate broker Jay Shaver said. In early June, after an obvious increase in solar customers, Electrical District No. 3 announced it would limit solar installations to 30 units per month and increase its fixed cost recover charge from 70 cents to $3. The decision was met with outrage in the community, but 244 applications for solar permits came through Maricopa City Hall in June in an effort to beat the policy’s deadline in July. ED3 also announced it will lower its electric rates 5.16 percent for most customers starting in January. After years of rumors and anticipation, the Maricopa Station business center opened on April 27. Starbucks was the first business to open, and Chipotle, Jersey Mike’s, Sport Clips and Zoyo Neighborhood Yogurt soon followed, with Freddy’s Frozen Yogurt and Steakburgers completing the project.